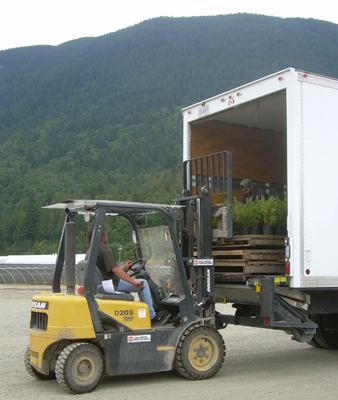 In order to minimize shipping costs for customers and reduce our impact on the environment, Sidhu & Sons Nursery attempts to ship only full truckloads (a full load equals a 42,500 lbs. or 51-53 ft. load). This requires a minimum customer order of ten feet of product per customer (e.g. 1,900 one-gallon plants or 1,000 one-gallon plants and 450 two-gallon plants). Individual customer orders that are not full trailer loads will be combined with other customer loads until a full load is achieved and will be delivered on a first-come/first-served basis. Vancouver and the surrounding Lower Mainland to the Fraser Valley as far east as Hope, BC. Minimum of 5 business days lead time to select and assemble plants, book transportation and complete necessary paperwork. Outside of BC Lower Mainland and Fraser Valley, including the United States. Minimum of 7 business days lead time to select and assemble plants, book transportation and complete necessary paperwork, i.e. Phyto-sanitary certificates. Quotes for loads are submitted to common carriers, unless a customer specifies a preference for a particular carrier. For more information and to set up delivery, please call the shipping department at 604-826-3537 (ext. 107).